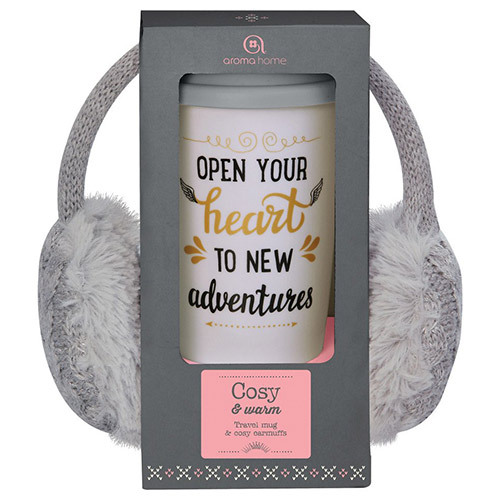 The combination of soft, cosy grey earmuffs and a ceramic travel mug are the perfect gift for anyone who enjoys long walks, working in the garden or watching sport on the side lines. Enjoy your favourite coffee or tea on the go with the reusable double walled ceramic mug exterior and silicone lid, which will keep drinks warmer for longer. The earmuffs are made from a combination of lambswool and acrylic, stylishly keeping your ears warm. They can be wiped clean to keep them looking cosy and fluffy. Beautifully packaged and designed, the Travel Mug & Earmuffs are the perfect gift combination. Below are reviews of Aroma Home Travel Mug & Earmuffs - Grey by bodykind customers. If you have tried this product we'd love to hear what you think so please leave a review.